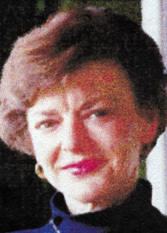 MERRITT ISLAND -- Karen A. Beck passed away Monday, February 5, 2001, at CapeCanaveral Hospital after a short illness. She was born in Wichita, Kan., and has lived in Brevard County for the past 21 years, coming from Virginia. She was a graduate of Brevard Community College and of the University ofCentral Florida in Orlando. Karen is survived by her mother, Jean Beck of Merritt Island; sister, Christine A. Beck-McKay and a brother-inlaw, Mark S. McKay of Salt Lake City, Utah; aunt, Marian Pican of Melbourne; and several cousins. She was preceded in death by her father, William J. Beck. A Memorial Mass will be held at a later date at Church of Our Saviour in Cocoa Beach. Burial will be inMulberry, Kan. In lieu of flowers, donations may be made to St. Jude's Childrens Research Hospital, 501 St. Jude Place, Memphis, TN 38105-1905 or to a charity of your choice. Beckman-WilliamsonFuneral Home in Cocoa Beach is in charge of arrangements.